According to ancient Greek legend, sometime back in the 6thcentury, a wrestler named Milos of Croton arguably created one of the very first training programmes for sport. Milos trained by carrying a newborn calf on his back every day until it was fully-grown. By the end of it, the calf was apparently a cow and Milos (if he was still able to even stand) was a much stronger man for it. Whilst carrying livestock around may not be particularly sensible, what this legend tells us is that you can improve your physical abilities by structuring your training. However, even if showering in champagne and climbing podium steps to rapturous applause is not your thing, training programmes are ultimately intended to make your paddling swifter, easier and hopefully with a greater chance of success. In layman’s terms, specificity means that your training should be specific to the needs of the event you’re training for. When you watch a film like ‘Rocky IV’, (with Stallone carrying trees and jogging through knee-high snow), it wasn’t because he had aspirations of being world winter sports tree carrying champion. It was because he’d felt that those particular exercises would maximise the functional strength and endurance needed in his boxing. In addition, an Olympic track cyclist (who may only race for just 3-4 minutes) will still often train for 4 hours or more – just to develop their aerobic engine as much as possible. In other words, you identify what you need and then design a programme to provide it. Overload means that you subject your body to a little more physical stimulus than it is used to. This might mean a paddling session is a little longer or harder or it might mean that the training you’ve done over the last few weeks is a little harder or greater than what you were doing before. It ultimately means that the training session should provide some form of controlled physical stress. Recovery though, is the key bit. Contrary to what you might think, you don’t get fitter or faster by training. Instead, you actually get the gains when you’re not really doing very much (i.e. sleeping and resting). Put simply, you push your body’s engine or muscles and they come back stronger or become more efficient. This is known as ‘supercompensation’. If you ditch your recovery or rest days, all you’re going to do is to get is tired or injured. I often see athletes enter a downward spiral whereby they don’t improve so they feel the best resolution is to train even harder until eventually (depressed and despondent), they give up or (or for the more stubborn), consistently under perform. The reality is often that all they needed was a little more rest. (but not all of these at once!). The final important bit is consistency. It’s no good putting in a bar bragging 6 hour paddle if you don’t keep the training going. You need your sessions to be backed up week after week. Continually skipping or being erratic with your training will ultimately block your potential. There is one final aspect (that is more of a piece of advice than an essential component of training) and it is one surrounding the act of patience. Six months before both the 2012 and the 2016 Olympic Games, GB’s cyclists was getting consistently well beaten in the velodrome. On the big day though, they nailed it and won gold having seemed pretty average a few months prior. In other words, keep your training discipline in place, stick to the sessions you had planned and don’t let your ego get in the driving seat ahead of your goal. Give the plan time to take effect and don’t panic. Commercial heart rate monitors have been around since the early 1990’s. They are now relatively inexpensive and once you have conducted some testing, you can define a series of training zones to help prescribe your training. It’s generally accurate enough but it can be significantly influenced by your level of hydration and quality of nutrition on any given day, your mental state or by changing your equipment or paddling technique. In addition, the calculation of training zones can be contentious (with ‘220 minus your age’ being a popular, if not inaccurate means of doing so). Alternatively you can determine your lactate threshold heart rate (LTHR) to set your zones. To find your LTHR, I recommend using a test proposed by well-known endurance coach Joe Friel who advocates a 30-minute time trial on your own. This test should be as hard as you can sustainably go for its full duration. However, 10 minutes into the test, click the ‘lap’ button on your heart rate monitor. When you’re done, look to see what your average heart rate was for the last 20 minutes. That number is a rough approximation of your LTHR and we can set training intensities based upon that. I often use short races to double for the test. Alternatively, perceived exertion relies more on your subjective ability to gauge how hard (or not) you are working. The most well-known of these is what is known as Borg’s ‘rate of perceived exertion’ (RPE). Borgs RPE is a 1-10 scale (with ‘1’ being little more than corpse upto ‘10’ being that of you resembling the Incredible Hulk in full rampage mode). Here’s a reproduction of the scale for you below. In rowing or kayaking circles, it’s not unusual to also use stroke rate as a training metric. Published research tells us that in a variety of paddle sports, as we increase our speed, we also have a tendency to increase our stroke rate. As a result, we can prescribe training sessions based upon this. The risk is that a tiring paddler may start to employ an inefficient paddling style – just to maintain the targeted stroke rate (and this is increasingly likely in longer paddles). For new or developing paddlers (whose technique is still improving), I wouldn’t recommend its use. For those with a few seasons under their belt though, it’s a viable gauge but I recommend you correlate your stroke rate against another metrics (like your heart rate) to set any zones initially. Finally, we have use of the good old clock. Average speed or time is the backbone of many sports. These don’t work for SUP so well though as water flow or weather can change hourly and really affect our performance. As a result, keeping an eye on speed is useful but having collated 3 years of my own data, I can honestly tell you that changes in weather will often swamp any improvements you may think you are making. By the way, on this subject I generally prescribe the total duration of my training session by time, not by distance for the same reasons. The weather and waterstate can really affect your speed so prescribing, say a 10km paddle could see a difference in time of 15 minutes if things aren’t going your way. That extra 15 minutes could cook you and destabilise your training for the rest of the week. So with all of this in mind, let’s show an example of a programme for an event that is typical of distance racing (i.e. an event of 60-90 minutes in duration) and held on flattish water. This is a 12 week plan that you can start a few months out from your chosen event. This plan is suited to an intermediate paddler who is likely to have raced before, can paddle three times a week but hasn’t used any formal structure. It works off the assumption that you can paddle a couple of times in the week for an hour and then a longer paddle at the weekend. Just to clarify how to read it – if the schedule says ‘30 mins @ 90-94% LTHR (RPE 3-4)’, this means that you do 30 minutes in at 90-94% of your lactate threshold heart rate value. If you do not use a heart rate monitor, this is also equivalent to a Borg scale 3-4 effort. 12 Rest 4×30 sec sprints with 5 min rest between each one then 10×1 minute @ max (RPE 7+) with 1 min rest. Rest 3×10 mins @ 100% LTHR (RPE 4-5). 5 min rest between each interval. Check all race gear ! Race ! Race ! Always have a warm up and cool down before every session. A very easy 10-15 mins paddling before you start will get your body primed and upto temperature. The order of these sessions is intentional. The higher intensity session takes place first in your week. Don’t mix this order up as you won’t get the best out of it. The first few weeks have an emphasis on increasing your raw abilities you’ll need but the emphasis shifts in the last few weeks towards a greater level of event specificity. If for any reason you feel tired or you can’t hit the intensity in a session, cut it short and go home (or make it an easy paddle). If illness or life gets in the way, take the time out and just pick the plan up from where you left it once you are well. Don’t jump ahead or try to play catch up with what you missed. Disclosures. Always consult with your doctor/physician/significant other before you ever start any kind of a training plan. Secondly, listen to your body. I use detailed software that tells me exactly what physical shape I’m in but the reality is that it’s all too easy to lose sight of the most powerful and intuitive computer system you already own – i.e. your head. Don’t disconnect from it. Finally, any plan is no substitute for good coaching. A good coach is someone who can create a tailored plan for you personally but crucially is able to respond when things aren’t going so well and can work with you directly to get the best out of you overall. Many can throw a plan together but good coaching is a real skill. Finally – don’t wear a calf on your back. It won’t make you a better paddler. Dr Bryce Dyer has a PhD in Sports Technology, was truly awful at most sports at school (aside from a single freak discus throw at aged 15 that he referred to as a ‘hand of god’ moment) and has since placed nationally in his age group in 6 completely different sports. 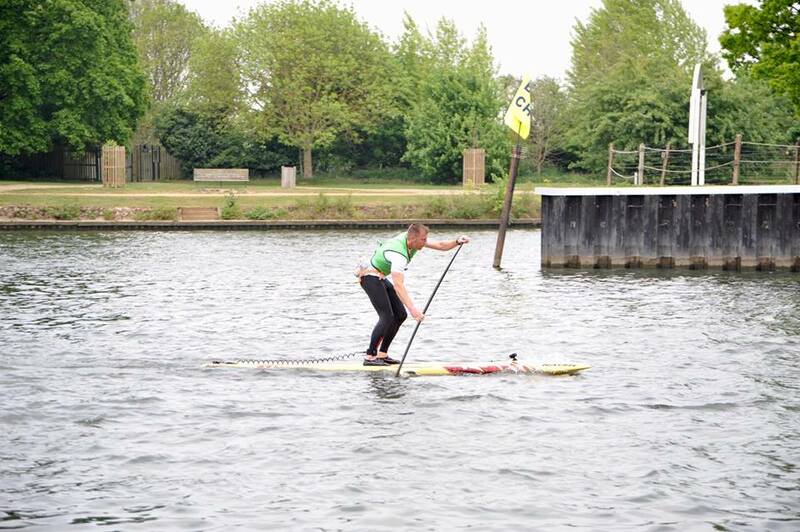 He is now a team paddler for Naish UK.